Hindustani music is based on time cycles. It is believed there are specific timings to specific ragas when performed at the appropriate time these ragas sound especially melodious. A day comprises 24 hourse while a Prahar is made up 3 hours each. Thus there are 8 Prahar in a single day. Starting 6 am the Pratham Prahar lasts until 9 am while the second part of the morning prahar begins at 9 am and goes on until 12 pm. The afternoon prahar is again divided into 2 parts. 12 pm to 3 pm to 6 pm. The evening prahar falls between 6 pm and 9 pm while the night prahar extended from 9 pm to 12 am. The late night prahar between 12 am and 3 am is followed by the early morning prahar between 3 am and 6 am. Thus completing the 24 hour cycle. With music for every hour of the day this album showcases the richness of Hindustani classical music while highlighting its intangible feature of Timelessness. Born in a family that has given to Indian classical music four generations of outstanding musicians the Mewati maestro had his initial grooming in music under his father lat Pandit Motiramji. He then underwent intensive tutelage under his older brother and guru, the late Sangeet Mahamahopadhyaya Pandit Maniramji. Endowed with a rich soulful and sonorous voice which traverses effortlessly over all three and a half octaves Pandit vocalising is characterised by a harmonious blend of classic and opulent elements projecting traditional music as an intense spiritual expression at once chaste ad densely coloured thus touching the soul of the listener. He has been guided in this by his spiritual guru late Maharana Jaiwant Singhji of Anand another doyen of the Mewati gharana. Perfect diction clarity in sur and extreme tunefulness command in all aspects of laya choice of composition and interplay of the notes with the words to evoke the desire mood and feeling are other highlights of this Rasraj, Pandit Jasraj?s music. Listening to him in New York stands testimony to his greatness. 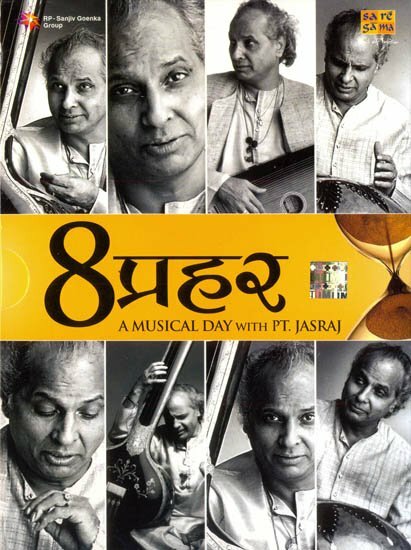 Pandit jasraj has been honoured with all the Padma Awards, Sangeet Natak Academy Award and many others. Besides, Pandit Jasraj has been honoured in the US by the Harvard university Art museum. In Vancouver he has set up the pandit jasraj school of music foundation and in New jersey the Pandit Jasraj Academy of Music. This unique thematic album is a 1990 recording by Panditji which was originally released in the LP format. As per this the duration of each raga is approximately 27 minutes. This very recording is now being made available here in this set comprising 4 CDs. CD 1 ? The album opens with the melodious morning raga Ahir Bhariav followed by raga Alhaiya Bilaswal belonging to the second prahar. Stating one day with this soothing melody in Pandit sonorous voice marks the auspicious beginning of a new day. CD 2 ? The rare raga Miyaki Sarang sets the tone for afternoon melodies and is followed by composition in the very popular raga Madhuvanti. CD 3 ? This CD contains two very rare ragas. Opening with a melody in raga Gauri from Bhairav Thaat the CD concludes with a composition in raga Asa Mand. Both these ragas belong to the evening Prahar. CD 4 ? Raga Jaijaiwanti is a night melody. A composition in this raga transcends the listener to another plane. Renditions in the midnight raga Kanada are Panditji?s speciality. At saregama we are privileged to have in our archives recording of Panditji is interpretations of the various form of Kanada. Such as Kafi Kanada, Darbari Kanda, Bageshri Kanada, Abhogi Kadana and others. The concluding bhajan in raga Bhairavi has been penned by sant Suradas and lends a beautiful closure to this unique album. The album ?Aath Pahar? covering every hour of the day is a delight for any connoisseur of music. It leaves the listener with a feeling of having spent an entire day with the legend Pt. Jasraj. A day sprinkled with the various magical notes stringing together a musical garland to be offered at the Lord Divine feet. ?Daiya Kahan Gaye Ve Log? ?Main Hari Son Chakra Dharaun? ?Tum Bin Kaun Mero Palanhar? D. K. Printworld (P) Ltd.